Developing with Apache Spark on Cassandra - tips, tricks, & examples. This is the place where I will provide the documentation around applications I am building using Apache Spark and Cassandra. Feedback, comments, questions, & corrections always welcome. It has been a busy 2015 (though you couldn't tell by looking here). I have a lot of stuff incubating that needs to be pushed out here once all the bugs are dead (and I find the time to write it all up). Going current on SBT as well. So hold tight - this stuff is coming. Also, just a heads up, some of the source out at github may be updated prior to the tutorials reflecting the changes. Everything should still work, but you may need to tweak versions of scala, spark, kafka, etc.. Welcome to the part three of the series 'Spark + Kafka + Cassandra'. Building on top of part one and part two, now it is time to consume a bunch of stuff from Kafka using Spark Streaming and dump it into Cassandra. There really was no nice way to illustrate consumption without putting the messages somewhere - so why not go straight to c*? Don't care about c*? Feel free to write to stdout, HDFS, text file, whatever. This piece is effectively designed to work with the message generator from part two, but you can put messages into your Kafka topic however you choose. Submit the application to generate messages sent to a given topic for some number of seconds. Have a running Spark Streaming application ready and waiting to consume your topic and dump the results into a Cassandra table. It is not mandatory that you have gone through parts one and two of this series, but it will make this part more seamless to do so. I recommend doing that and then return here. 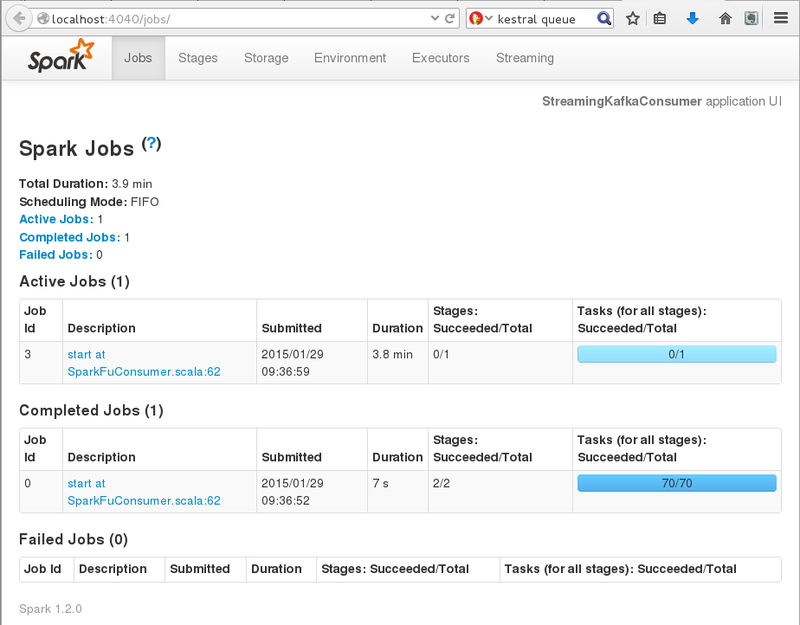 Begin by cloning the example project from github - spark-streaming-kafka-consumer, & cd into the project directory. In a terminal, from the project root, fire up SBT and assembly the project to create your application jar file. Like before, take note of your jar file location (highlighted above). Also, note that we have set the resulting jar file name in assembly.sbt - here we have set it to sparkFuStreamingConsumer.jar. If your local Spark cluster is not up and running, do that now. Go here to see about getting 'r' done. Having reviewed the code you have seen that out of the box, this streaming application expects ZooKeeper local on port 2181 & Kafka local with a topic of sparkfu. Additionally, a local Cassandra instance with keyspace sparkfu and table messages should also exist. The CQL for this table is at the root of the project. See my post on local Cassandra if you do not yet have that bit in place. Once Cassandra is up and running execute the CQL to create the messages table. If all has gone well, your streaming application is now running on your local Spark cluster waiting for messages to hit your Kafka topic. You can verify at http://localhost:4040. If you have just recently completed part two, your application will likely be busy pulling messages from the sparkfu topic. However, let's assume that's not the case. So, fire up the message generator from part two and run it for a few seconds to publish some messages to the sparkfu topic. Produced 9282 msgs in 5s -> 1856.0m/s. So, we should have 9282 messages in our topic (in this example). We should also, by the time we look have that same number of messages in our messages table in Cassandra. So there you have it - about the most simple Spark Streaming Kafka consumer you can do. Shoulders of giants people. So tweak it, tune it, expand it, use it as your springboard. Not sure - I may just work custom Kafka encode/decode into this example. May also, model the data in more of time series fashion to make reading from Kafka a more practical exercise. Thanks for checking this out - more to come! Welcome to the part two of the series 'Spark + Kafka + Cassandra'. Also, this example can easily be altered to spew whatever one might like (CSV, JSON, data from a flat file or HDFS, etc.). Make it yours - spew your own stuff. If you have not walked through Part 1 of this series, go there and walk through it to get ZooKeeper and Kafka up and running on your local machine. When you've done that, come back here and proceed to the next step. Begin by cloning the example project from github - spark-kafka-msg-generator, & cd into the project directory. As per normal, take note of where your jar file gets put (highlighted above). Also, note that we have set the resulting jar file name in assembly.sbt - here we have set it to sparkFuProducer.jar. Like Part 1, when this application is submitted to the cluster it will have no clear output. Here again we can use the local consumer. Do as below or look back to Part 1 to see about this. Produced 134137 msgs in 20s -> 6706.0m/s. If you were running your local consumer you should see a big ol' pile of alphanumeric randomness stream by. Just like that you can spew a pretty good chunk of messages to a topic on command. On to part three where we'll consume messages out of Kafka with Spark Streaming and write them to Cassandra. See part three here! Welcome to the part one of the series 'Spark + Kafka + Cassandra'. In this series we will look to build up a Spark, Kafka, Cassandra stack that can be used as the foundation for real projects on real clusters that do real work. In subsequent parts of the series we'll look at consuming messages from Kafka using Spark Streaming, using custom encoders, adding Cassandra into the mix, and hopefully top it off with something that will run against a small cluster. So, before we even clone the example application, we have to do a bit of work to get ZooKeeper and Kafka up and running on your machine. At the time of this post, 0.8.2-beta is the latest release. The current stable version is 0.8.1.1. So let's use 0.8.1.1 - start by downloading it here. (NOTE: This is the Scala 2.10.x version!) Other variants are all available here if you have other needs. The rest of the example will assume this is the case. Yes, there is an infinite number of ways to get ZK up and running - but the above is as far as I'm going here. Simple and functional. The next set of steps is near exact copy of the Kafka Quickstart. I have tuned the bits here that jive with the example application so do look at the Kafka docs, but do follow the steps below. Assuming you have Kafka downloaded and extracted as above, lets start things up, create our topic, and get a list of topics. All of the above commands spit out a goodly amount of "stuff" to your console, but just a bit of careful examination should have you feeling confident that everything is up and running correctly. Most importantly, when you listed out your topics that somewhere in that output you saw sparkfu listed (will be on it's own line). Once your producer is started and staring at you, you can enter any string and press [Enter] to produce the message. Within a moment you should see your message parroted back to you in the terminal where you started up the consumer. If you crave greater details review the Kafka documentation. Begin by cloning the example project from github - spark-kafka-producer, & cd into the project directory. If your local Spark cluster is not up and running, do that now. It's not!? Mon Dieu! Go here to see about remedying that. Assuming you have poked around in the code, you will have seen that the Messenger within MillaJovovich.scala (a few will see my humor...) will produce four messages for the topic sparkfu and send them. So, when this application is submitted to the cluster it will have no clear output like our previous examples. This is where the consumer you have running will come in. If you stopped it no worries, just restart it as you did above. Truth be told you could start it up after the fact since we are telling it to read all messages from the start of time. But isn't it more fun to see messages come in as your job is sending them? Yes, it is. No! No! NO! What the FU! That's it. Well, that's it as far as scraping ever so lightly at the surface of this topic. In the following parts of this series we will dig a bit deeper. Thanks for following along - stay tuned! With the new year a week old, the Spark-Fu slowdown must come to an end. Took some much needed time off over the holiday to recharge. But that's all over with now and I'll be ramping back up with more Apache Spark on Cassandra examples using Scala and Python in the coming days and weeks. Happy New Year from Spark-Fu! As an exercise, I am working on duplicating my previous examples in Python. It is clear that Python has, and is gaining, traction in the data world. So, it makes sense to have a working knowledge of it. As with my other examples, everything will find it's way to my Github repositories - forking and enhancements welcome. This effort is about the most simplistic Python submit to Spark Cluster example possible. But, when you move beyond the REPL, you have to start somewhere right? Begin by cloning the example project from github - super-simple-spark-python-app and cd into the project directory. Move the file tenzingyatso.txt to your home directory. Modify simple.py path to the sample file (save and close). ...or some such similar thing. Spark it up (with python)! If your local Spark cluster is not up and running, do that now. If you need to review how to go about that, you can look here. Since this example does not have a packaged application (e.g. jar, egg, etc. ), we can invoke spark-submit with just our simple python file. Your expected output to the console should be a line count of 7 wrapped in a nice battery of asterisks and the copy from the first line of the example file. If you see that - this has worked. UPDATE! (2014-12-12): Wide tuple write example added. I won't lie, it is not elegant - but worth knowing the basic concepts of how to work with tuple bigger than two. Pull the updated project code to check it out. The most rudimentary mechanisms for writing Tuple2 to Cassandra are pretty well beaten to a pulp. In this post I hope to shine light on few additional, more complex ways to write data to Cassandra as not everything we do with a Spark/Cassandra stack will be reduceByKey on key/value pairs. In the first example in this series we will fetch some data from Cassandra directly into a case class. Then we will transform that RDD into a more compact version of itself and write the resulting collection of case classes back to a different table in our Cassandra cluster. We will be sticking to our 'human' example from previous examples however, I have tuned the schema a bit. To keep your life simple, I recommend executing the updated CQL which will create a new keyspace and tables for this example. Begin by cloning the example project from github - sbt-spark-cassandra-writing, & cd into the project directory. At the root of the project you will see two CQL files: sparkfu.cql and populateHumans.cql. You will need to execute these two files against your local Cassandra instance from Datastax DevCenter or cqlsh (or some other tool) to set things up. // Letting Cassandra use default names for the indexs for ease. CREATE INDEX ON sparkfu.human ( stateprov ); // Maybe we need good people by state? CREATE INDEX ON sparkfu.human ( firstname ); // Good people tend to be named "Brad" - let's find them fast too! // Clearly this is a horrible model you would never ever use in production, but since this is just a simple example. Errors? No. Good - we are set to proceed. In keeping with our theme of finding good people, we'll do it again. But this time, as you will see in the project source, we will fetch only good people in the first place, transform them into a simplified RDD, and store them off safely separated from all the not good people. Alysia Yeoh is a good, simple person. Edward Snowden is a good, simple person. Fatima Nagossa is a good, simple person. Pete Jones is a good, simple person. Brad Karels is a good, simple person. Mother Theresa is a good, simple person. Hiro Ryoshi is a good, simple person. Neil Harris is a good, simple person. B Real is a good, simple person. Alysia Yeoh is transgender and can be reached at 3215551212. Neil Harris is male and can be reached at 9045551212. Mother Theresa is female and can be reached at null. Hiro Ryoshi is female and can be reached at 7155551212. Brad Karels is male and can be reached at 6125551212. Pete Jones is male and can be reached at 6125551212. Edward Snowden is male and can be reached at null. Fatima Nagossa is female and can be reached at 7895551212. B Real is male and can be reached at 9995551212. If all has gone well you should see output like the above. Please note, we are also TRUNCATING the goodperson and personfromtuple tables just before the program exits, so if you look in Cassandra those tables will be empty. Feel free to comment out those lines and validate directly in Cassandra. Then play around with it. Extend the case classes, add columns to the schema, add more transformations, etc.. These simple examples will serve you best if you extend and make them your own. There is likely good cause to start playing with creating and altering table structures dynamically.